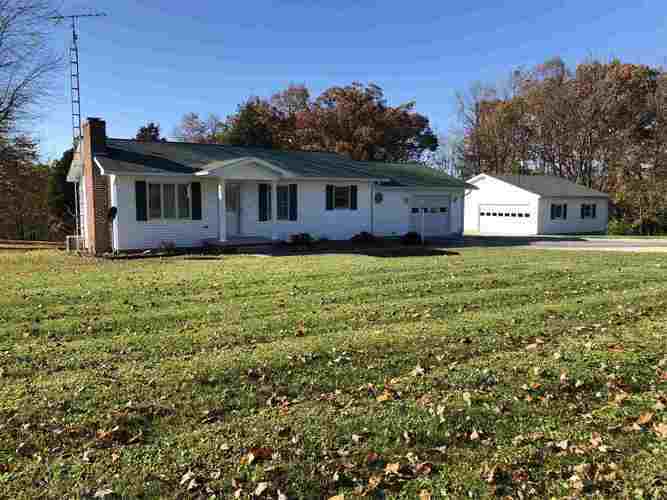 VERY WELL KEPT 2 bed 1 ½ bath home located south of Loogootee with a country feel on a paved road. You are sure to enjoy the large back yard w/the wood land for a back drop as well as your deck that overlooks it. This property offers the potentiality of an in home office w/ the large room that has abundant windows ( sunroom ) and its own entrance to the outside that is covered by a nice porch. This would be great for having customer meetings in-house, but still staying separate from your personal living area. Very nice garage to store your big boy toys. This property has been well cared for with many improvements being made in the last several years including but not limited to. : 2018 new roof on the garage and house / 2015 New vinyl, soffit, fascia, and guttering on the garage, / 2014 new 400 series Anderson windows in house, as well as new siding, soffit, fascia, and one new exterior door / 2005 new cabinets, new solid wood interior doors, new carpets, new garage door opener, and new plumbing. Buy a home that is ready to move-in tomorrow!! Directions:Turn off US Highway 231 on Brooks Bridge Rd. Go half a mile and turn right on Elliot lane. Go half a mile and property will be on the right. Listing provided courtesy of Integrity Realty Group LLC.